Creating software solutions to business problems is an enjoyable, creative and fulfilling process. The full lifecycle of creating a true solution from nothing requires a range of skills that can only be successfully be contributed by a team with people from different backgrounds. I'm writing this post for two reasons. Firstly, I'd like to lay out (38,000 feet view) for discussion how my team works to create commercial solutions from a blank page (much like the Account Opening solution I talk about on this blog). Secondly, the organization I'm in is rapidly evolving so I'm hoping that writing this down will help me absorb and respond to how I best fit. When there are changes to the people around me it still unsettles me, making it hard to concentrate on my real job - this is not fear of change, more the primeval fight or flight response kicking in. 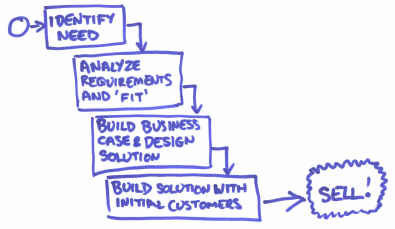 I work in a group that produces what Gartner seems to call Composite Process Solutions. For us these are solutions that exploit the strengths of the Vignette product set and competencies, more directly addressing business problems than the components can alone. For a quick background, Vignette is an ECM vendor with core products offering best of breed web content management, portal, collaboration, document imaging, workflow and records management, so there are a lot of components to play with. At the same time, we acknowledge that we can't do everything, so we team with partners to help us create more complete solutions. Account Opening for high-value financial services products is a solution that is being pushed through the lifecycle at Vignette. Few vendors can present a solution to the many business problems that financial institutions experience during account opening. Even the large consultancies and systems integrators are not presenting a clean, well defined story of what to do in this space, especially for high-value and high-risk products like annuities and mutual funds. Perhaps the most complete vision that is out there right now is IBM with a heavy focus on banking. This was strengthened on August 2nd by its acquisition of Webify, strengthening IBM's online and SOA capabilities with Webify's prebuilt adapters and toolkits, alongside the standard IBM BPM and WebSphere 'integration' base. Smaller companies have reasonable solution sets for specific market segements. Fineos (from Ireland) have well packaged solutions for retail insurance, CashEdge has specific point components for banking. Surprisingly the ECM/BPM vendors have not done a good job of leveraging their past experience in handling paper applications for finserv and insurance to address the new online world. How do we create net-new solutions and raise them til they have flown the nest? I don't believe that there is anything proprietary in here and the process pulls from influences like Geoffrey Moore's Crossing the Chasm, Deloitte's PILM, Accenture's innovation strategies and our own thinking. Certainly at this level you wouldn't guess what it is that we are doing that is particularly novel. And not being in a consultancy firm, I'm not in a position to tell you the particularly smart things we do! I know that there are many ways to run through this process and many people will have their own view on this type of 'innovation lifecycle'. My group is responsible for developing ideas from the many feeds we have, creating business cases and seeking funding for those solutions that appear to have real market requirement that we can address, so that eventually we can produce a commercial solution or two that provides an ROI on our investment. Then we "repeat as necessary". Its all a fairly intuitive thing: you create new ideas, filtering them as they pass through a funnel so that those that don't fit your profile drop out, giving the best ideas that are potentially most profitable a chance to be developed and commercialized. At each stage the filter focuses on different things, ensuring that the company doesn't just keep pouring resources into a money pit if earlier observations or assumptions prove to be incorrect. The non-intuitive piece is learning how to sell the best solutions to your own company. Not only do you need to sell to the executive team to gain investment (a good business case is essential), you also need to convince the field sales, marketing, product management, services, licensing, engineering, and others I may have forgotten to mention, that the solution is worth their effort to pay attention to. Without the support of the rest of the corporate world even the best solutions will just fade away without ever being seen by a potential customer. In the last 18 months I have built out business cases for a range of compliance, governance, business improvement and online b2b solution use cases. Not all made it through the funnel - commercialization is our objective for the best-fit solutions only. For several potential solutions we could not demonstrate that this group could provide value in developing the solutions further. That does not mean that they are not good opportunities for per-customer engagements. Most of our solutions are available to the field salesforce to chase on specific deals if they choose, so although our run rate may not be high on 'commercialized' solutions, little we produce is absolutely wasted. And that is the joy of risk-taking. Choosing to bury a solution late in the process may be the most appropriate thing to do, given new priorities, new findings, or an unexpected response from the market segment you have selected. An essential thing to bear in mind is that it is important not to become emotionally attached to any one pet solution. The strong opinions, weakly held approach is essential here, both when convincing the salesforce of the merit of what you are asking them to chase, as well as when making your own decisions about where to go next. The group I work with I consider to be partially intrapreneurial - see Scott Gatz for an interesting post or two on this subject and my thoughts on it. We were, until last monday, a group of four, with a range of experience and skills: business analysis, accounting, product marketing, professional services, training, management, software development, systems architecture, sales. I fill the Solutions Architect role based on the broad but shallow set of skills I have within this set. The purest intrapreneurial team consists of volunteers recruited to the idea by one or more lead intrapreneur(s). They form a core team which stays with the project from its early stages, well past its initial commercialization or implementation. Because of the influence the 'lead' has and the requirement to work closely together as a tight group for quite a period of time, the team and especially the attitudes of the people within it, is extemely important. Being honest to yourselves is essential. Don't fall for your own hype. We are not entrepreneurs after all - my house and health are not riding on this one solution, so I can perhaps show a little more than blind faith in my approach being right. Being honest with those around me and assuming that it is mutual, is essential to what we are doing. As I have hinted at all through, solutions are enjoyable beasts to work with, but they are truly wild animals. They are tamed by the people that lead them and refine them. Right now my group is facing a lot of upheaval in terms of organizational change. This is distracting in terms of knowing what to focus on in the near term. This post has been tough to write, although its been useful to help me to get myself balanced for the next big shift. My apologies if its also been tough to read. Either way, I hope that it has been a little insight into the world of solutions innovation, inside a company that is better at pure product technology innovation. We are all learning this stuff, and I hope we can continue to help the company truly capitalize on its investment. The purest intrapreneurial team consists of volunteers recruited to the idea by one or more lead intrapreneur(s).